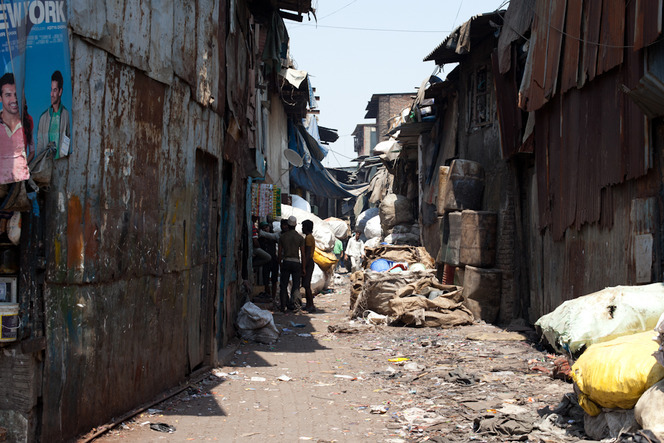 Visiting one of Mumbai's slums was top on our list of things to do. We'd heard stories of hope and perseverance; of people building life from a few pieces of cardboard, corrugated steel and plastics. In fact, on our boat trip down the Amazon we met a Spaniard who had lived in a Mumbai slum and made a film about the fight over land. Over the course of his experience with the slum's inhabitants he watched as the cops burned and flattened the land multiple times. Each time the people would wake up, share chai with the police, and rebuild their home all over again from the ashes. On one occasion he encountered an old woman asleep in a hammock, refusing to put her house up again for the umpteenth time. He asked the people why and they said, "She is old and tired. Her time has come." He found countless phoenix stories but also swan songs. He told us life goes on for this community; somehow they can keep on compassionately and not hold a grudge. So while our interest had been piqued, we were stuck on logistics. Then in early March we met Roy, a fellow traveler from the UK who has spent his professional career as a traveling structural engineer. He has a wealth of interesting stories, a wise way about him, and a seemingly boundless wonder for new locales. Needless to say, we became fast friends. We wouldn't be exaggerating to exclaim that if in 20 years we've been to half as many interesting places as Roy and retained a semblance of his outlook, we will consider ourselves lucky people. So one sunny Sunday in March, we met Roy in Colaba and planned to take the boat to Elephanta Island. That was, until Roy mentioned another idea. He'd been out for a wander the weekend prior and - while, like us, he wasn't usually one for guided experiences - he took a chance on a guy named Pinto. Pinto walked up to him on Sunday (Roy's day for adventure) and asked if he'd like to visit the usual sites. To which Roy gave the usual "No thanks." Then Pinto asked if he'd be interested in visiting a slum. And Roy responded, "Well, I haven't done that before. Is it safe?" Pinto explained he knew the locals and could take him inside Dharavi. So Roy went for a look. And the following week we joined him. What we have found is very important with tourism - especially visiting a local community - is finding the right sources to guide you. You are always riding a line between connecting with people and exploiting them, between education and entertainment, between giving and taking from a community. Every guide and resource is selling a story from their own perspective. That Sunday, we all decided to make a bet on a Kashmiri cab driver and city guide named Pinto. He'd been living in Mumbai since '97. Like many cabbies all over the world, he left his family (in Kashmir) and traveled to the big city to make a better income. Pinto's story, his perspective as a guide, we would come to realize, was about the vast industriousness of Dharavi. We entered Dharavi from the main road, a stretch that houses food stalls and plastics vendors and even a school - a small room, really, nearly crumbling at its seams. Many tours begin and end on this main road, encapsulated by a wave of the hand toward the slum and a look at the famous water pipe across the street. Yet with the sun beating down and the smell of melting plastic all around, we slipped into the shade of a tiny alley overhung with corrugated steel. We were welcomed by the scent of freshly baked bread coming out of one doorway. A peek inside was met with a flurry of activity. These bread makers were busy at work making the mini crunchy toasts found all over the city. After exchanging smiles and samples, we bowed out of the tiny room with its two blazing bread ovens. On and on it went, this labyrinth built of sweat and scraps, housing literally thousands of workshops. Pinto had developed a rapport in this particular alley, he told us, because it was unusual in Dharavi due to it its diversity of workshops. Many sections of the slum contain only one kind of workshop - plastics recycling and Rajasthani pottery are among the most famous. On the two parallel streets we visited, however, we were greeted by textile makers, bakers, sari makers, embroidered shirtsmiths, jeans makers, smelters, broommakers, jewelry makers, and the list goes on. And plastics. As we made our way, passing goats and children and stacks of any conceivable kind of recyclable, the system for plastics recycling in India unfolded. Towards the beginning of the corridor of overhanging shanties, we came upon a rather large room filled ceiling high with trash bags stuffed with all sorts of plastics - spools, scrap packaging, water bottles, detergent bottles, etc. Outside were large trash barrels sorted by color. Stacked high in the yellow barrel were well-worn hard hats, which most likely protected heads beyond their suggested disposal date. In the next shack two men worked at washing, drying, and sorting light-colored plastic squares. In countless others men were standing abreast of beastly-looking shredders, some wearing a single glove, processing plastic shoe heels or film spools. As we continued down the carpet of old plastics, we came across the melting and reforming workshops. There's plenty of film fodder for the mind to process when thinking about these ingenious though somewhat terrifying industrial cycles. (Méliès' beautiful films being melted into heels in Hugo and humans being fed the liquid death of others in The Matrix immediately come to mind.) Yet what we encountered was, more often than not, a grinning face. In one room a continuous hot, black noodle was being "cooked" and cut into shorter pasta-like shapes. In another, plastics were being further shredded and laid out to dry in the afternoon sun. We were witnessing a spontaneous industry, an informal city, but one whose goal comes naturally to many of the Indians forced into shantytowns: repurpose what's available and make something from it. A December 2011 NYTimes article describes India's "informal" economy, run in no small part by the inhabitants of India's slums, as generating anywhere from $500 million to $1 billion annually. This economy is built upon the "hundreds of millions of shopkeepers, farmers, construction workers, taxi drivers, street vendors, rag pickers, tailors, repairmen, middlemen, black marketeers and more." This includes some 60% of Dharavi, not to mention people like our guide, Pinto. Villagers are flocking by the millions to take up these very positions. And the more they come, the more their overwhelming desire to live in cities becomes clear, as does the government's inability to accommodate them. Yet it's not uncommon to hear of "slums" like Dharavi in the same sentence with flippant remarks of crime, disease, and danger. In fact, it would be uncommon to hear anything other than a checklist of reasons not to visit a slum in central Mumbai. People in Mumbai talk of them like the thought alone makes them want to scrub their minds clean with wire bristles. A slum to most of us signifies squalor caused in no small part by the neglect of its habitants. Yet when we professed an interest, we were met with opinions - in large part - by people who had never visited Dharavi or anywhere else. It turns out it is in some part judgment, not the conditions of the slums themselves, that depict this sort of picture. This judgement seems to say: "If I ever found myself impoverished, I would just 'think' myself out of the situation." It's no secret that thoughts have powerful impacts, judgements too. And there are many true stories of people who have thought themselves out of poverty. In the west we call these inspiring stories and we fill our TVs and magazines and movies and books with them. But we rarely take a trip to visit a slum. To be fair, it requires a lot of presence of mind to travel anywhere in the world these days and try to experience it without judgements based on prior expectations. Most days I find myself lacking in this presence. Dharavi is unique in Mumbai, and, well, around the world, for it sheer number of active workshops. The slum is home to somewhere between 500,000 and one million people in an area that spans some 550 acres (check out the NYTimes map). Many live without running water, electricity, access to sanitation, medication, and education. And yes, they live well under the poverty line. But they live and many of them work, and - as our guide Pinto pointed out - they aren't necessarily asking for handouts. To relegate Dharavi to being a destitute place in need of charity, but not a place for tourists doesn't fit the whole picture. Part of traveling - in our argument, one of the good parts - is interacting with people and seeing how they live. The reverse of this - submitting locals to droves of tourists with cameras and cell phones and money falling out of their pockets - is quite controversial. But to label all visits to slums as commoditization is to simplify things. And to suggest that the people living in Dharavi, sorting empty Dasani bottles or film canisters for recycling, are cut off from capitalism (and further that we are cut off from them), is truly naive. They're immersed, daily, in one of its dirty little secrets: trash. As we wove our way through the barrels of plastics and by each shop window, we witnessed something, while not everywhere, still quite overwhelming: a sense of pride. Some of this outward excitement was obviously aimed at us and our silly yet honest attempts at speaking in broken Hindi. But its something, I believe, that was present even after we had left their doorsteps. We noticed, unmistakably, they were proud of their work. But visiting a neighborhood like Dharavi - once - cannot really begin to form a complete picture. The people, the supplies and scraps, the industry are the embodiment of change. It's hard to get a handle of what picture you're seeing. There's the smiling, prideful faces of the workers, some with ample time to lounge around after a Sunday lunch. There's Pinto's eagerness to show foreigners how Indians can make something out of nothing. Then there's the ever-present wash of modernization. I look at Dharavi and think WOW, look what ecological devastation my country caused because of a lack of checks and balances. But what will happen to India if left unchecked? The conditions themselves in Dharavi are appalling. We were constantly within stepping distance of live wires, ungloved and unmasked hands and faces, toxic solids and gases, exposed rebar, unventilated rooms, and rivers of fetid water and trash. And we only walked the length of a Manhattan city block. Yet those little businesses function with minimal government intervention (including taxes). The more we travel, we realize how much the US is comprised by an intricate system of rules and enforcement. (Duh, I know.) Mostly, the days of squatting and being above the law are long gone. Yet here, in the center of Mumbai, is this huge, informal city running on an informal economy with almost one million inhabitants. Dharavi is a fascinating study for anthropologists and economists alike. And the more people who visit, study and learn from Dharavi, the more these conditions will come to light. On the day we visited, all around us, the people of Dharavi were making clothing, materials, products, and building houses out of things we throw away every day. These industrious people of Dharavi can teach us about perseverance, about value, and where to go from there.